Prevent, Protect and Combat cyber attacks for Windows Remote Desktop Servers. Install in less than a minute. Two clicks to change the world. Forget the complexity of GPO & AD. Simply say : Now, all users of this group are in Highly secured user environment, but in this same group, this account will be in Secured user session, when other will work in Kiosk Mode. Easily import Applocker's rules without opening GPO, allow Homeland Access, define Working Hours, and Control Intrusion attempts. What you say is what you get immediately. Your decisions are applied without reboot needed, without logoff/logon for connected users, and will be applied for your futures accounts or unconnected users. 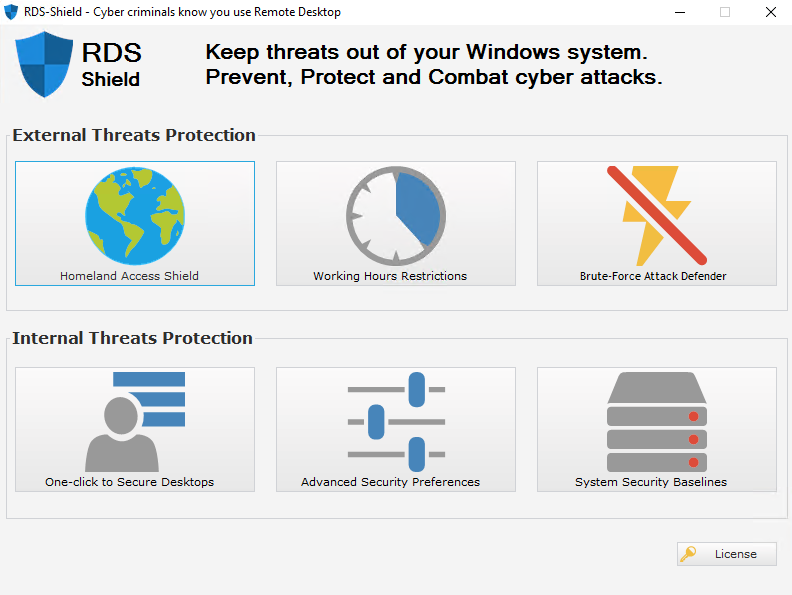 Really, with RDS-Shield you have the easiest solution to increase dramatically the Security of your Remote Desktop Server. You don't have 15 minutes to discover it ? Seriously, take your watch and try RDS-Shield.